While most fathers try to teach their sons useful, practical things like how to change a tire or fix a leaky faucet, my father was bent on teaching me how to make wine. Every Saturday in October when I was growing up in Swansea, MA, just over the border from Providence, he would rouse me from bed at the Dickensian hour of 8:30 a.m. I’d stumble out to the acre of grapevines in the backyard and sleepily eat a bowl of Count Chocula cereal while he quizzed me on whether the grapes were ready for crushing. The tiny vineyard, along with a sizable vegetable garden and a dozen and a half fruit trees, was a holdover from his youth in Portugal. 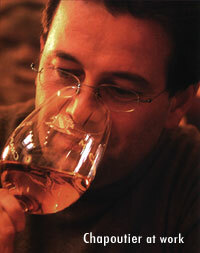 As a child on São Miguel, the largest of the Azorean Islands, he helped his father make the family wine. Now, apparently, my Dad felt it was my turn. As he droned on, I fantasized about sticking my tongue to one of the cold metal poles that held up the vines, just so I could make him stop. In the 30 intervening years, I’ve never had a flat tire or a drippy faucet, but this past October, for the first time, I wished I had paid attention to my Saturday-morning wine lessons. 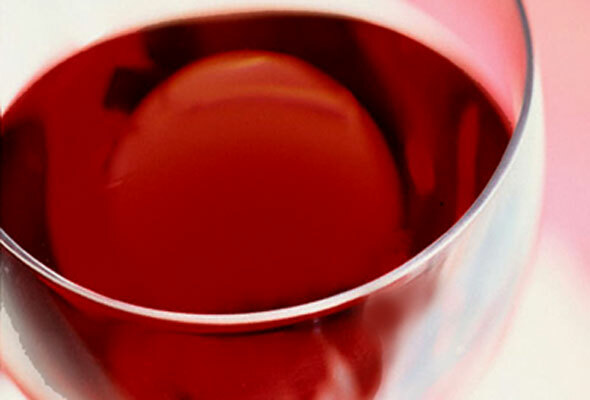 The trouble began when I got a call from Kristin, a friend who works in the wine business. She was calling to invite me to a tasting of Michel Chapoutier’s wines that was to be held at Daniel, one of New York’s poshest French restaurants, just across Central Park from where I live. “Who’s Michel Chapoutier?” I asked, doodling on my pad. “Yes, of course,” she replied. “Seven courses.” There was no need for more questions. The promise of a delightful buzz and the succor of Monsieur Boulud’s food brought me to Daniel’s doorstep an embarrassing thirty minutes early. I ducked inside the warm elegance of the cherry-paneled lounge, where one clairvoyant waiter pressed a glass of Chapoutier’s Côtes du Rhone ‘Belleruche’ Blanc 2001 into my hand and another circled with a large tray of goat-cheese gourgères, which, considering the emptiness of the room and of my stomach, I was tempted to wrestle him for. As the lounge filled to overflowing, and Michel’s wine began working its French charm, Kristin floated over to me, in the way that stunning, impossibly thin women have of moving. Just then the doors to the private dining room opened. She tucked her arm under mine, and we walked into the blast of golden light — much like lambs to the slaughter. Once inside, we searched for our table. “Look, we’re sitting with Michel,” said Kristin, pointing to the head table. “Just be yourself,” she answered, as she flitted across the room on business. “Ask him something about his family,” she offered, before being swallowed up by an eager circle of blue suits. This was the first time in my gastronomic history that I would have been willing to opt for the wobbly table near the restrooms. Before I had a chance to switch my place card with someone from another table, I found myself face-to-face with an ebullient, instantly likable man, who, if my eighth-grade French was to be trusted, was Michel Chapoutier. Sensing possible disaster, I beckoned Kristin. She peeled herself away from a conversation and sidled up beside me, seamlessly taking over. She proceeded to rattle off my credentials in such an authoritative way that I began glowing brighter than the room. Chapoutier, it seems, was impressed by my C.V. Clearly I had underestimated myself. Sitting at his table would be a breeze. I’d simply place myself at the opposite end and, with Kristin by my side, toss off a few bon mots and sail through the evening. The manager motioned for us to sit. Just then the maître d’ and a waiter clamped down in a tight tête-à-tête, and, after a shuffle of chairs, I found myself sitting to the right of Chapoutier. I looked at Kristin, who had slipped into the seat next to mine, outmaneuvering a portly guest. I turned to Chapoutier, but he had already bounded to the middle of the room, trying to get people’s attention. At least I’d be able to listen to him speak and then cobble together a lame question or two. As he talked in practically flawless English, I began to understand why so many people in the wine industry aren’t surprised that he’s turned around his family’s once-faltering vineyards: He’s so charismatic, he probably coaxes the wine out of the grapes and right into the bottles. He made topics such as biodynamics, terroir, and malolactic fermentation (subjects many winemakers relish making indecipherable) utterly intriguing. His brief ten-minute talk resulted in a dozen business cards worth of notes. Thankfully, he turned our attention to the 14 wineglasses in front of each of us. The waiters swarmed and filled the first. As Michel commanded the room, Kristin walked me through the tasting. “What does it smell like?” she asked of a 1998 St. Joseph ‘Les Granits’ Blanc. I shrugged my shoulders. “Wine,” I mumbled. “Well…that’s a start,” she said, with far more patience than I could have mustered had I been in her place. “What does it taste like?” I looked around the table and watched the others inelegantly slurping their wine. I did the same, only I was unable to prevent it from dribbling down my chin. “Wine,” I said mournfully, dabbing at my tie. “It’s all right,” she said. “You’ll get it. Honest.” I wasn’t sure for whose benefit that was: hers or mine. Worn out from trying to catch and copy every behavioral nuance of my fellow diners, who, if their jewelry was any indication, probably had wine cellars as big as my apartment, I contemplated feigning a headache, which wouldn’t have been a stretch considering the Herculean amounts of wine I was drinking. Kristin, perhaps tired from all the instruction, excused herself, and I was left alone with the others. I was sure without her to fend them off, they’d circle and attack. I was about to admit everything when I heard a disconcerting gagging noise from the other side of the table. Everyone looked over, and the most stylishly dressed of all of us—the man who had intimidated me into silence when he said, of the 1998 Hermitage ‘Chante Alouette’, “The fruitiness of the wine brings out the pineapple in the Peeky Toe Crab Salad without overwhelming the other citrus flavors”—spewed the most perfect, shimmering arc of wine up and over the table and across the suit of my would-be interrogator. Stunned, we all turned to Michel for a clue on how to react. Apparently accustomed to such spurting, even one with so impressive a trajectory, he simply looked on with amusement. It was then that I began enjoying myself. Watching Old Spouty grovel and apologize, as well as admirably fend off a tsunami of jibes (mostly from my wine-stained inquisitor), I realized that the mystery surrounding wine was just that: a mystery. I was at a loss as to why we reserve the pleasure and understanding of wine for a sacred few. 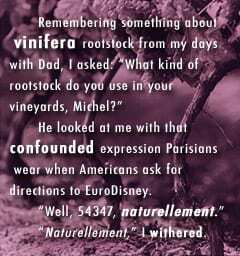 I’d have bet that out of the entire room, Michel and I were the only people who were born to fathers who felt it was their duty to quiz their sons on the various yeast strains used in the wine-fermentation process. And although I didn’t have the moniker of Master Sommelier hitched to my name, my palate was just as good as that of anyone sitting at that table. After all, I had the same equipment, didn’t I? I grabbed the last glass of wine to be poured, an intense garnet-colored 1998 Banyuls Terra Vinya, which was made from 100-percent dark Grenache grapes, whatever they were. I swirled the wine around so vigorously, I came dangerously close to centrifugally flinging it over all the guests. I planted my nose deep in the glass, inhaled, and concentrated. When that didn’t work, I let my mind wander. What was this? I nuzzled closer to the wine and took another sniff. It couldn’t be. “Wait. Don’t tell me.” My nose was getting overwhelmed, so I removed it from the glass to refresh my olfactory sensors — a phrase I picked up from Chapoutier. Then back in: “I smell fruit, dark fruits. I can’t go beyond that. But there are definitely chocolate and fruits in that glass,” I added victoriously. She flipped through Chapoutier’s brochure to the page describing the wine and held it up for me to read: “Nez: Cooked fruit and cocoa aromas, very intense flavors.” She was beaming. I felt like prancing around the room with her, just as Audrey Hepburn and Rex Harrison did in My Fair Lady. I broke through! I was no longer the little Cockney boy of viticulture cruising the wine store, picking up whatever ill-bred bottle happened to be lying in the sale bin. I had tasted and, for a moment, understood the good stuff, and I wasn’t going back. Since then, I’ve hosted several wine tastings at my apartment, with Kristin presiding, of course. I order wine with almost every meal these days, and happily slurp, much to the mortification of nearby diners. I’ve jotted my observations on napkins (both paper and cloth), place mats, and, when a waiter, after having seen me scribble on the back of an expensive-looking menu, refused to get me another, my hand. I’ve since taken to whipping out a small pad, which, for some reason, has the power to make complimentary appetizers and cocktails appear, maître d’s hover, and chefs pop out from their kitchens. It looks as if class is back in session.